... and a big congratulations to Emily,the new Design Star! Here's a peak at her own home office... a beautiful blend of vintage and modern that we've come to expect from her work on the show. See more of her work space here. 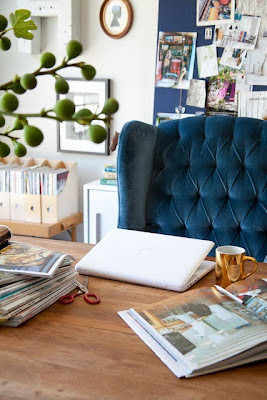 Just love that tufted navy velvet! Hope your week's off to a great start everyone! P.S. Read the charmingly adorable + completely talented Emily's blog here. So happy she won, she has such good taste. That office being a testament to such taste! Kate - me too! Her work is stunning, and she seems so sweet to boot! A nice little virtual date -tea for three then, sounds perfect! Hope you're all enjoying a cozy afternoon! Daniella I think the Scottish tea fixation is derived from so many afternoons just like this!